This is one of only 1,200 bottles of cellar-aged, late release, Estate grown 2010 Pinot noir, to carry this print of an oil painting by Heike Davies, specially purchased for this wine by Anthony and Olive Hamilton Russell. 2010 was a wonderfully complex and structured vintage with the fine-grained “European” tannins and rich, dark spicy fruit, characteristic of our extremely clay-rich and iron-rich soils. This was a particularly highly celebrated wine internationally. 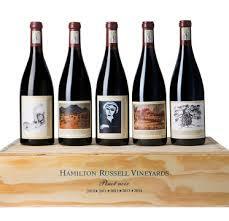 This is one of only 1,200 bottles of cellar-aged, late release, Estate grown 2011 Pinot noir, to carry this print of an oil painting by celebrated landscape artist Piet van Heerden from Anthony and Olive Hamilton Russell’s collection. 2011 was a lighter, tighter, more feminine vintage with wild red fruit and marked elegance. This was an unusually low yield year. This is one of only 1,200 bottles of cellar-aged, late release, Estate grown 2012 Pinot noir, to carry this print of a painting by Jan Vermeiring from Anthony and Olive Hamilton Russell’s collection. 2012 was a gorgeously opulent and textured vintage with lifted dark fruit perfume and spice. This was a Wine Spectator Top 100 Wine of the year worldwide. This is one of only 1,200 bottles of cellar-aged, late release, Estate grown 2013 Pinot noir, to carry this print of an oil painting by Stefan Ampenberger of Olive’s ancestral home, from Anthony and Olive Hamilton Russell’s collection. 2013 was a rich, structured vintage with dark, wild fruit and a sumptuous palate. This was another highly celebrated vintage internationally. This is one of only 1,200 bottles of cellar-aged, late release, Estate grown 2014 Pinot noir, to carry this print of a charcoal drawing by Arabella Caccia, specially purchased for this wine by Anthony and Olive Hamilton Russell. 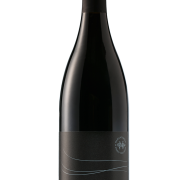 2014 was a tight, bright and vibrant vintage with lower alcohol, beautiful fine-grained tannins and pure wild red fruit.